Growing your cannabis at home is an amazing feat. But, how cool would it be if you could even make some organic compost yourself? It doesn’t make sense to pay money for compost. Especially when it’s just decomposed dirt and can be easily made at home. 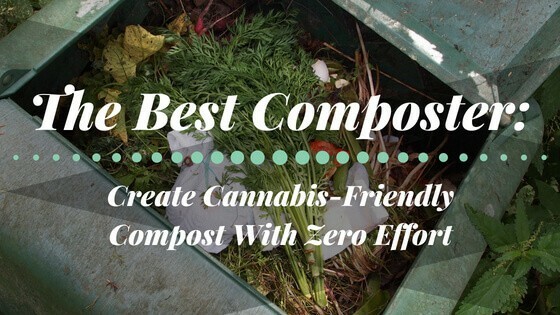 Composting vegetable scraps is an excellent way to build an ecosystem for your cannabis plants. It requires time and patience, though. It can be done faster, however, if you use just the right equipment. And that’s why you need composters or compost tumblers. Today, I’ll tell you the importance of using a composter and how to use them. The cannabis you grow will be used in edibles. Or you'll perhaps smoke it. Since you’re ingesting it in one way or the other, it’s best to use organic ingredients to grow cannabis. Compost encourages microbes that help your plants grow vigorously. In other words, compost is life. It’s a natural process that will happen with or without human intervention. For instance, food left on your table will decay no matter what. Your job is to provide a proper environment to derive humus-rich soil. Organic matter is broken down slowly, and the ultimate result is compost. It’s a natural fertilizer delivered by none other than Mother Nature. There are many organic gardeners out there that don’t rely on fertilizers. They use compost to grow dense buds. Fertilizers can do more harm than good if you aren’t accustomed to the proportions. But with compost, you can use any amount and forget about it. You can use old soil by mixing it with compost. With all the macro and micronutrients present in the compost, you don't need expensive fertilizers. And the most important reason for you to compost? You’re turning waste into organic-rich soil. In short, you’re contributing to a greener earth, and I doubt you need other reasons. If making compost is that easy, why use a composter, you ask? Well, making compost is incredibly easy, yes, but only if the right conditions are met. Compost is produced only with a right balance of oxygen and moisture at the right temperature. If you mess up the ratio, you’ll end up with waste that stinks to high heavens! Also, the ratio of the browns to greens must be appropriate for the compost to work. While browns are dry waste like paper or straw, greens include fresh waste like leaves. Greens are high in Nitrogen that helps your cannabis plants in the vegetative stage. The brown material supplies carbon. In traditional composting setups, the waste must be shred into smaller pieces before you begin. If you dump all your waste, it will take a long, long time to compost. Generally, it might take anywhere from 3 to 10 months to finish the process. And that’s if you’re not shredding the waste. However, if you manage to chop it into little pieces, you’ll be fine. With a compost tumbler or a composter, you don’t have to worry about all this. Just dump an equal amount of greens and browns, and the composter will take care of the rest. There’s another important factor to remember while composting. And this applies whether you’re using a composter or not. The waste must be turned every once in a while. Turning the waste helps to build heat and accelerate the process. If you’re using a drum, for instance, you must be aware that it’s a back-breaking job. As the drum is filled, it becomes very difficult to mix the waste. This is where a composter is helpful. Most composters are set up on stands that allow you to mix the waste easily. All you need to do is use the handle to turn it, and—voilà—you’re done! You can then remove the compost and use it directly on the plants. Instead of waiting for ages, a composter will save you time. If you own a good tumbler, your compost will be ready in just 6-10 weeks. Many people have huge grow rooms to tend for. If that’s you, you can consider buying two composters. This way, you’ll never have to wait for your compost. The process of composting is an act that brings all tiny microorganisms together. You get rich black gold only if the ingredients support the process. Yes, you can get rid of your waste, but there are some dos and don’ts. Also, consider the space and why you’re composting. Is it for a small vegetable garden or a big garden that resembles a farm? While some items decompose quickly, other ingredients like tree branches and stems of plants take a lot of time. If you want compost quickly, use simple stuff like fruits scraps, egg shells, small bits of paper, cardboard, and leaves. It’s even better to use powdered items like coffee grinds to accelerate the process. The more the heat in the composter, the faster you get the compost. You can also add spoiled food like rice or anything else that’s cooked. However, stay away from citrus like lemon and lime peels, pet waste and meat waste. Many people use meat scraps in their pile, but it will attract every little critter in the surrounding area. So now that you have an inkling on how composting works, let’s take a look at some of the best composters for cannabis available today. And here’s a quick video that explains composting in great detail. 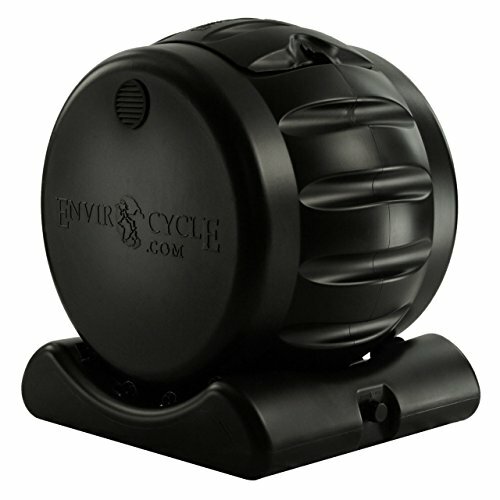 Touted as the world’s most beautiful tumbler, this composter from Envirocycle is truly beautiful. It takes just about six weeks for you to turn your waste into compost. Compost tumblers are heavy and can be a pain to transport. However, this tumbler is placed on rollers. Moreover, the composter itself is shaped like a wheel. So, you have to roll it from one place to another. Another added advantage is that you get compost tea as a bonus! The base of this tumbler can collect up to 5 gallons of liquid compost tea. Compost tea is expensive, but it has a plethora of advantages. With the Envirocycle tumbler, you get the compost tea without any added effort. A large opening at the very top allows you to dump waste easily. And, you can remove the compost just as easily. Since it is small, it’s a perfect fit for even apartment dwellers. Miracle-Gro is very popular among cannabis growers. This heavy-duty dual composter from Miracle-Gro is one of a kind. It's easy to assemble, and you can start composting in less than an hour! Thanks to its dual chamber, you can add waste in one chamber while the second chamber allows the waste to decompose and cure. This way, you’ll never run out of compost. The entire unit is sturdy and will last a long, long time. 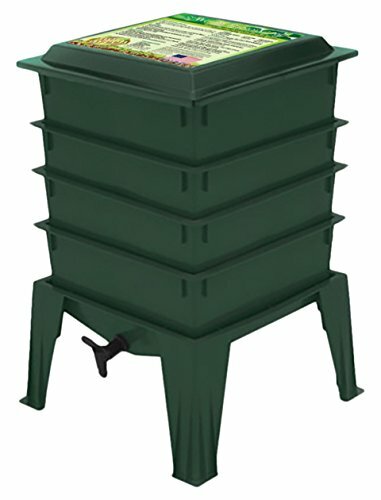 The composter is also equipped with mixing bars that accelerate the process. 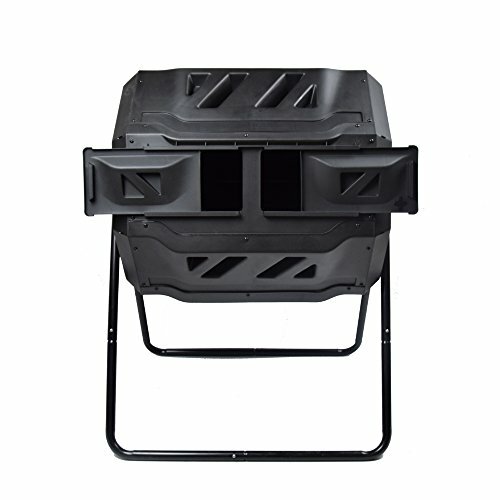 Although it’s heavy, the composter can be transported from one place to another with ease. Within 4-6 weeks, you’ll have a chamber full of nutrient-rich compost your cannabis plants will love. After adding the waste, your only job is to turn the compost using the handle. This compost tumbler from Ejwox can hold up to 43 gallons of waste. With such an impressive amount of compost generated, you’ll never be short of it. The main problem cannabis growers face is that it takes time to decompose. But this composter comes with dual chambers. So, you can fill waste in one chamber and wait for the compost to cure in another. It also has slide doors to dump the waste. The composter can be set up within an hour, and you can start immediately. Just make sure that you have an appropriate ratio of browns and greens and you’re all set! You don’t need to mix the waste by hand as the barrel can be rotated easily. Remember to turn the barrel at least five times a week to speed up the process. 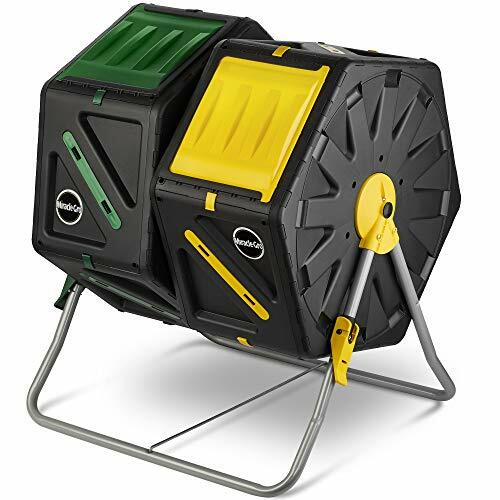 This compost bin from Algreen products is a simple compost bin. It’s sturdy and lasts for a long time. Also, the plastic is 100% BPA-free recycled plastic. So, you can rest assured that your compost is free from any inorganic plastic. The bin is designed in such a way that it insulates heat and encourages more microorganisms. Another advantage is that it comes with a self-watering lid that can be locked. This mechanism keeps critters away from your decomposing compost. The only con is that this heavy-duty compost bin has no rollers. So, it can be a little tough to transport. However, you can set it up and forget about it. With a capacity to generate about 12.65 cubic feet of soil, this bin is certainly huge. Earthworms are your best friends. Especially if you want to grow dense colas. Earthworms generate compost that’s second to none. No mixing, no smell, and no fuss at all. As long as you keep the worms happy, your work is done. But that’s the hard part because worms are finicky. If you don’t manage their home well, you’ll soon be dealing with earthworms trying to escape! So, if you’re a beginner, it’s best to rely on a composter like Worm Factory to do the hard work for you. It comes with four trays that can be expanded up to 8 trays. You also get an instructional DVD that explains how to use the Worm Factory 360. Also, you get to collect worm tea that’s absolutely amazing as a fertilizer for cannabis plants. Honestly, worm compost is the best fertilizer out there for all kinds of plants. The only issue is managing the earthworms, but Worm Factory makes it easier for you. If you want to grow the best organic cannabis, learning how to compost is one of the most helpful skills you can learn. While it may take hard work and patience, it pays off tenfold. To get the most out of your efforts, pick up one of the best composters or be prepared for a lot more work. In truth, you don't need a composter at all, but instead of tumbling you will have to go to your compost pit and flip everything with your shovel every day. I don't know about you, but I would rather twist a handle then all of that! Was there any more questions you had about composting for cannabis? Ask away in the comments below!